On 11th January 2011, arrive Varanasi also known as the 'City of Light', and the sacred Ganges River. Varanasi is one of the holiest places in India and is considered by Hindus to be a most auspicious place to die. The old city of Varanasi, where spirituality and commerce mingle, is a maze of narrow streets shared with pilgrims, locals, sacred cows and Hindu sadhus (holy men). Ghats along the river are teeming with people, sounds and enormous activity. 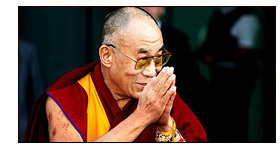 From 12th till 16th January 2011, visit Sarnath (Dalai lama Tour) to attend and listen to the Dalai Lama's annual teachings. His Holiness Dalai Lama will offer five-days of teachings at Sarnath, where the Buddha gave his first teachings to his first 5 disciples on the Middle Way, the Four Noble Truths, the Eightfold Path and Non-self thereby 'turning the wheel of the law'. Visit the Dhamekh stupa also include in Dalai Lama Tour, the Deer park and temples of different Buddhist countries. Also visit the fine archaeological museum, which houses the Ashoka pillar and the Lion capital from the 3rd century BC and the famous teaching Buddha from the 5th century AD. In the evenings, explore some of the facets of Varanasi, whether it is the 'Ghats' on the Ganges where Hindu pilgrims and locals come to perform their rituals including the beautifully choreographed 'aarti' (worship) offering of elements to the goddess Ganga. You will go for a boat ride on the Ganges, walk the ancient alleyways, visit the cremation area and the temples, and meet knowledgeable local scholars, teachers, artists, cultural and environmental activists and crafts people. You will also visit silk weaving workshops which use techniques which are over 2500 years old. On 17th January 2011, after the annual teachings, you can take flight to your onward destination. Excludes : Any tips, Portage, Airport Taxes, Insurance etc.